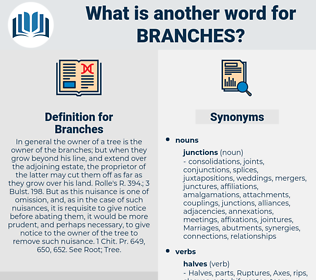 What is another word for Branches? 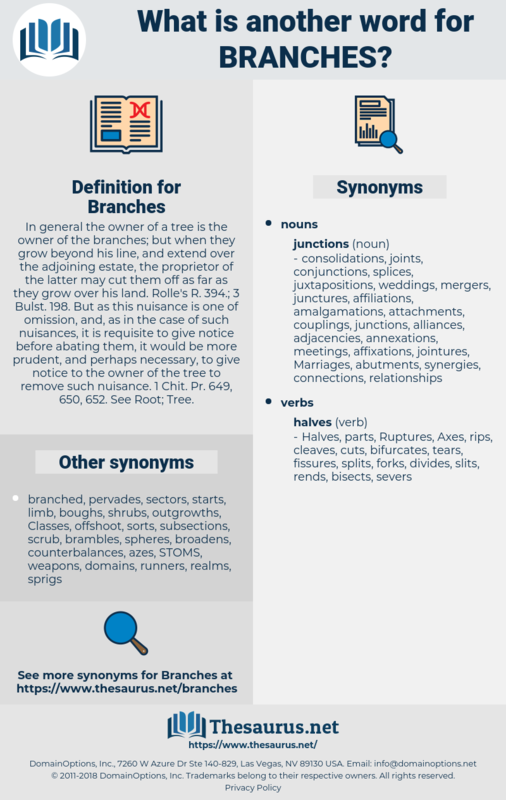 In general the owner of a tree is the owner of the branches; but when they grow beyond his line, and extend over the adjoining estate, the proprietor of the latter may cut them off as far as they grow over his land. Rolle's R. 394.; 3 Bulst. 198. But as this nuisance is one of omission, and, as in the case of such nuisances, it is requisite to give notice before abating them, it would be more prudent, and perhaps necessary, to give notice to the owner of the tree to remove such nuisance. 1 Chit. Pr. 649, 650, 652. See Root; Tree. branchlets, subdivisions, forks, limbs, boughs, twigs, sticks, branching, departments. chambers, chambres, Agencies, groupings, subsectors, comoros, clusters, boards, managers, panels, fields, Sciences, RAMAS, functions, senates, Houses, rooms, pools, Studies, types, credentials, directorates, pouvoirs, Trustees, departments, directions. interdepartmental, credentials, headings, portions, organs, governors, pouvoirs, columbia, tract, tracts, panzer, DIR, palm, secret, divide, Ean, Trustees, topics, IAD, state, directorategeneral, department, departments, direction, directions. instructions, directorate-generals, BRAS, inspectorates, operations, secretariats, administrations, establishments, corporations, representatives, Associations, organisations, chambers, chambres, machineries, subfractions, institutions, authorisations, ramifications, neighbourhoods, sub-categories, responsibilities, authorizations, agency, Agencies, stretches, specializations, factors, considerations, counterparts, representations, Benches, committees, groupings, reaches, subsectors, factions, centers, channels, matters, chains, implementations, delegations, Patches, charts, sub-components, subclauses, subsections, attachments, centres, replicates, tentacles, locations, Factories, detachments, Companies, Boundaries, manifestations, sub-divisions, corners, implications, connections, machines, configurations, proceedings, districts, principals, ministries, subheadings, sub-sections, sub-sectors, humanities, constituents, Categories, relatively, compartments, prerogatives, managements, introductions, Stations, represents, directorships, comptoirs, sub-centres, courses, installations, Governments, patterns, implantations, structures, spurs, formations, networks, partitions, tribunals, particulars, grand, Attorneys, outbuildings, secteurs, currents, trainsets, avenues, exchanges, commands, Apparatuses, hubs, disbursements, Constituencies, differences, extensions, subclasses, parts, disciplines, quarters, Perceptions, ranks, components, banks, Occupations, backgrounds, purposes, apartments, streams, supports, Charges, trains, ways, agences, pipelines, competences, circles, courts, clusters, regions, cards, specialisms, endeavours, superpowers, Schools, Operators, boards, vouchers, Orientations, shops, Firms, Movements, managers, stores, halls, different, courtrooms, appliances, respects, Dependencies, examination, premises, presentations, niches, professions, performances, arrangements, careers, colleges, bars, discharges, protagonists, Paths, solicitors, Entities, routes, ingredients, associates, barristers, Specialities, stripes, Trainings, sources, Arenas, settlements, Faculties, gangs, splits, Capacities, organes, conductors, Activities, pillars, PATHWAYS, amenities, hands, spheres, locals, Tendencies, effects, tiers, stakeholders, panels, sidings, contacts, delegates, conduits, depictions, annexes, competencies, filiales, aircraft, Plants, sects, grades, armaments, fields, Sciences, actors, things, LONGLINES, fittings, heads, hours, ramets, instances, agents, Trees, Guidelines, majors, swathes, Specialties, elements, Tracks, derives, domains, NODES, shutters, steps, balances, wards, members, MALLS, checks, Forums, Fora, estimates, thrusts, sub-offices, functions, strands, blocks, aspects, wings, zones, dimensions, schemes, Lawyers, legs, outlets, minutes, sites, sub-units, officers, Schedules, bedrooms, departures, organisms, layers, forces, Houses, scores, links, corpses, PORTS, particles, villages, Bays, gates, Commodities, portrayals, submissions, Phases, circuits, providers, methods, ethics, antennas, Towers, Abilities, Parties, Leaves, radiators, Appendices, hives, vines, levels, campuses, trends, versions, aerials, feelers, tubes, tabs, presences, Ones, Firearms, Missions, Scales, scopes, trades, rooms, shoots, FORMATS, booths, panes, points, tasks, sub-items, platoons, settings, control, tariffs, Cells, shares, regimes, cleavages, stalls, Programs, teams, doors, FACETS, frameworks, tips, squads, exits, Boxes, shapes, review, devices, homes, walks, suites, realms, desks, features, fronts, volets, profiles, posts, outflows, aims, venues, divides, estates, sides, modalities, Clients, inputs, flaps, rifts, Angles, Forms, Maps, themes, outings, dishes, pockets, outposts, skills, images, pieces, plans, demands, places, polls, objects, nets, frames, Blinds, Elles, choices, stages, seats, weapons, audiences, outputs, doses, auspices, pools, passes, trips, Studies, Dies, rods, Goals, subjects, troops, sorties, spaces, bottles, Countries, players, kinds, sets, PAGES, tiles, fold, wishes, feuds, Bases, bouquets, modes, utmost, Fees, Drives, unions, Plays, Sports, items, types, Styles, runs, Guns, guys, credentials, headings, portions, organs, directorates, governors, pouvoirs, tracts, topics, headquarters, directions. directorate, directorates, directorate-general, section, sections, bureau, Bureaus, Bureaux, division, divisions. offices, directors, Businesses, sections, Bureaus, Bureaux, divisions. He put them on the small branches. She then made her way back to the road, breaking down branches of the shrubs to make a way for Fluff, who was now on his feet looking about as if in search of his little mistress.